Tagged under redjuice, Shion Mizuki, Production I.G, Series. The original character designs are drawn by redjuice. The illustrator of the manga adaptation is Shion Mizuki. Some anime shows are so bad, you can tell they're going to be horrible from the start. Then there are shows that look promising on the outside, only to be completely hollow and unsatisfying on the inside. Guilty Crown is an example of the latter type, a series built on good intentions and crowd-pleasing elements that end up being wasted. Sure, it's fun to look at, kind of like a fireworks display or a pinwheel, but that's about it. There are a lot of elements within Guilty Crown that have the potential to be great standalone story particles, but as a whole, it lacks a sense of purpose. The Apocalypse Virus is neat, I guess, but releasing a crippling, humanity-destroying virus kind of seems like a generic bad guy thing to do. This anime is good also, but I do not really like it.. It is very simple yet complicated I think.. It is somehow similar to Code Geass- Lelouch of the rebellion, but it is not as good. Even though the art and the design is good, the plot is not so good and the characters are not good enough for me, it makes me feel bored by watching those,characters, specially the main protagonist (he is a wimp).. The fighting scenes is just fine. The plot is average. For me is is not very good enough.. I like this anime very much!!!! Inori is cute and my favorite character is Gai, Mana is terrifying ,disturbing and hateful and even Haruka disagreeable...Shu is also a great character (even whit his weakness). I'm only giving it such a high grade because of the animation,which is stunning.The show itself doesn't deserve more than 5.It's plot is a train wreck and the characters are not the least appealing.Waaay to hyped this one. Beautiful animation, visual effects and style of art. The plot and characters are extremely similar to those in Code Geass - the protagonist meets a mysterious girl, obtains a supernatural power and joins a resistance group fighting against the government. The characters don't evolve much, as many people complain, but I don't see that as a problem. Some characters simply are static. The main storyline is entwined with retrospective scenes from (not only) the hero's past, without which it would be impossible to understand. The whole anime was a bit predictable but I guess that the magnificent animation and quality music balanced the lack of thrill. The bad copy of Code Geass. So copied that the comparison cannot be avoided, so bad that the comparison is immensely humiliating. The few original things of the story and the few decent characters drown in a plot that is meaningless and confusing from the beginning to the end: the characters' actions are never explained and often seems to be inconsistent, battles are insignificant, without strategy and without a stated goal and in the end there's always the Apocalypse, a hackneyed idea. The only thing worth mentioning is the art, with a wonderful character design and gorgeous scenery. GAI TSUSUGAMI: "I always had one goal, now as then. You have chosen to build on it your dreams and then you have chosen to be disappointed, that's all." The songs in this anime were touching.Everything fell into a common anime story a normal guy that unexpected gets powers that can save/change the world while falling in love.But the characters were very cute and I like the idea of materializing your "heart".The ending was a bit sad but the anime was entertaining. This was another one of the new series that I was really excited to see. I like the character designs. 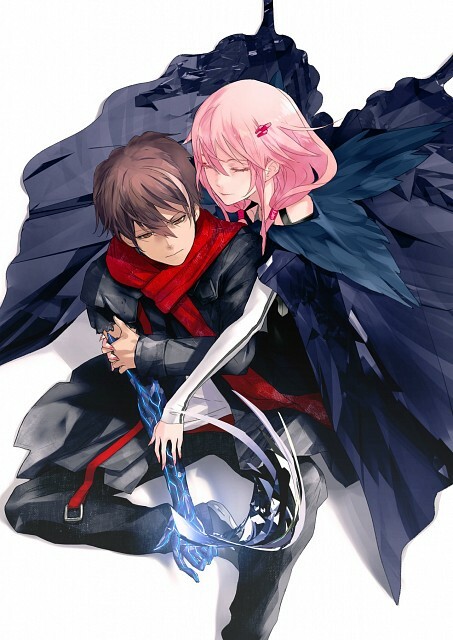 Guilty Crown feels like and reminds me a lot of Code Geass in many ways, the story itself is pretty similiar — right down to the main protagonist with the Power of Kings, the resistance group trying to liberate Japan, and the prevalent use of mechs. The characters are all incredibly interesting at first, but soon enough you’re looking for more growth from them as the plot progresses and you just…don’t get it. Shu, as the reluctant hero, is unsure of what’s going on around him at first. However, as he gets further and further into the mystery surrounding his family, himself and the virus, he doesn’t seem to develop in a way that I hoped he would. One episode he’s incredibly unsure of himself and then the next he’s so focused on what’s going on around him and determined to accomplish whatever his objective is that he just turns into a cold, cruel, uncaring prick. Just when you think that he’s finally come to terms with his powers and what's going on in his life to change for the better, he goes back to being a weak-willed teenager completely unsure of what he wants. On some level, I could understand why this happens – I'm pretty sure that anyone in Shu’s situation would be unsure of themselves from time to time – but after he basically vows to become King of Tokyo and remove GHQ from their position of power, he only ends up putting on a cold mask in front of others but is still the wavering, indecisive Shu that we’ve see throughout the series, so nothing actually changes in terms of his character. In contrast to Shu’s up and down development as a character, Inori doesn’t seem to develop much at all. Throughout most of the series she’s the same complacent, unemotional character that goes along with whatever Shu wanted to do; regardless of whether those things were right or wrong. It’s only when I learn the truth behind Inori’s and why she’s alive to begin with does she finally show some more emotion and a bit of development. One thing is certain though; her dedication and love for Shu were the only things that remained constant. The rest of the cast didn't develop very much, but considering they didn’t have a huge role in the overall plot, that was somewhat expected. Poor character development aside, the plot was fairly decent but it was confusing and too rushed at times, and didn't live up to expectation, the animation was gorgeous and the soundtrack was nice to listen to. The first few seconds were all the anime took to capture my heart. The song "Euterpe" was beautiful. The melody. The lyrics. 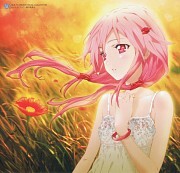 Inori's voice (provided by Chelly). It blew me away. Plot-wise, it took a bit too long to get fully warmed up. But once things started to get interesting, the energy and pace are able to keep me engaged and gripped. The whole thing was not too original. I kept seeing shadows of Code Geass all over the place. Terrorists and the 'Power of the King' and all that. Though as the story progresses, it develops its own characteristics and tone. Usually, I despise stories with weak protagonists. Shu seemed like one at first, but the moment I saw his eyes when he first used Inori's void, I realised he's much more interesting than he had previously let on. Though I still find his whiney manners a bit irritating at times, I see his potential in become a worthy hero. The graphics are top-rate. And the light effects are splendid. A very ambitious show that fails at its attempts to be epic with sub-par character development and a plot that ultimately does not give the show anything to recommend it over the many other good shows that are out there. This anime could have been much better. Tne end was messed up, a lot of things were left unclear. But still I like it very much, GC is one of my most favorite anime and I still can't stop admiring Tsutsugami Gai, rergardless of what he had done. It is true; Guilty Crown does have some rather obvious similarities to a couple or so stories, not all of which are as well-known or as recent as Code Geass, but having seen & read no less than a couple of thousand anime, novels, manga, plays, TV series & movies, I am well aware that there aren't that many stories left untold, & that stories, all stories, are essentially the same. That, however, doesn't necessarily make them into 'cheap, bad imitation' stories. So yes, I am enjoying Guilty Crown. The gorgeous presentation, setting, & style have definitely won me over, and I like the beautiful art & character design, the wonderful music, & the fluid rhythm of the story. Production I.G has taken a gamble & won by handing the project to young & not-so-mainstream anime-fan artists, resulting in a series with a visually & vocally engaging storytelling, even if it can be rather predictable at times, it still manages to keep its fantastic charm & style at top notch. So, everything that makes me whole ima kimi ni sasageyou. I'm Yours. Took me some time to really get into watching this, maybe the first eps trying to be exrtaordinary but they cannot, cause of the plot development. A normal student with weak personality becoming some kind of hero all of a sudden, don't even know why. He can draw out people's hearts as weapons (Voids)... I didn't like the idea at first. The strongest point of this show (next to amazing art) is plot and main character development I think. It gets really serious with time and Shu (the main) builds his personality through many failures, mistakes, weaknesses and tragedies. The usage of Voids became really interesting with time as well. But it all becames really amazing from around episode 15. So we have 7 last eps to be rated 10/10, the previous 8/10 and the first ones even 7/10. So if you are gonna watch it - watch it to the end. And of course I'm seeing it as independent anime with it's own style, even if there are elements copied from Code Geass and such. CG is a masterpiece with a genius as main char, GC is just a good show to watch with weakling who trying to be Lelouch with time, but is original in his own way. Guess every show which trying to be another Code Geass will fail, so there is no point in comparing. Wonder how would CG looks with GC art... wow! This reminds me of Code Geass, mechas and a pretty girl giving a school boy a powerful weapon to defend the revolutionary guys. The artwork is wonderful, but the story is so much predictable, animation and artwork are the only reasons to watch. /* I couldn't say moe, more i mean. This is real stuff man. hurr... the development is being crappy. the story, characters, though the latest episode, (ep11), is quite the tongue to bite.